I was rocking out in my own world this afternoon. Headphones on, I stomped through some fresh, clingy snow on my weekly quest for foods that will make me win at life, no small quest. It takes me forever to buy groceries. My other half won’t come with me anymore, since perishable items will turn to penicillin before I’m done ogling the fruit, sniffing the cheese, and reading extensive nutrition labels in the cereal aisle. It dawned on me today, as I shuffled across the intersection with my purchases. The realization stopped me dead in my tracks, and nearly got me run over by an angry approaching streetcar, furiously dinging its bell. My absolute favourite thing to do in a new city is to lose myself in the supermarket, or even better, the farmer’s market. Above all else, I love foreign snack food. After wandering the aisles for an eternity, leaving no product unmolested, I emerge victorious. Anticipating the upcoming sugar high and food coma, my basket is weighed down with binge worthy foods. Green onion crisps, mysterious brown sauce, Bieslis, Tim Tams, air dried cod, hakàrl, fresh pita and hummus, arancini, chocolates, exotic fruits I’ve tasted but once, curry buns, Orange Fanta. I calculate the exchange rate to a more familiar currency, and either rejoice at my find, or clutch my chest at the gouging prices and the saturated fats I’m about to indulge in. I waddle happily to the check-out line cooing myself into a happy, food-induced trance. 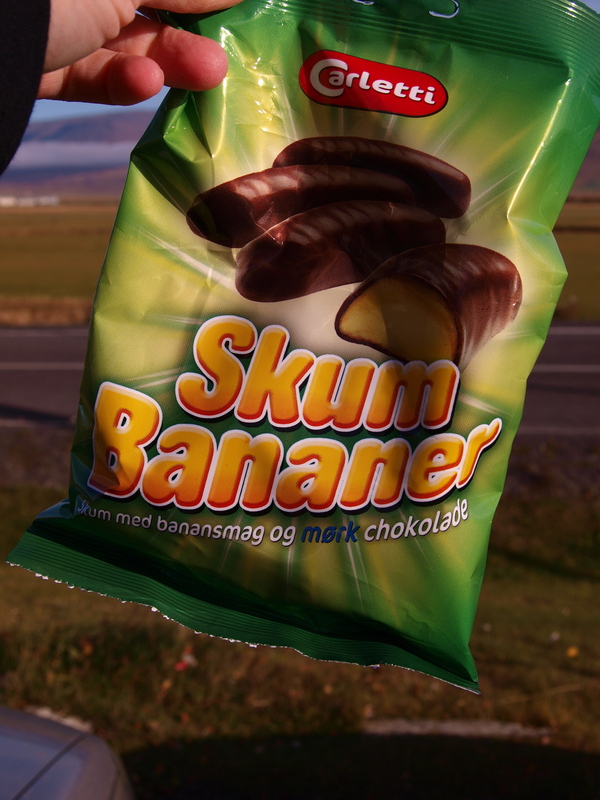 And I emerge with foolish purchases such as Skum Bananer. Where did I go wrong? When did I think that anything with the word skum on the packaging could be delicious? The only time I wasn’t bursting with glee in a foreign market was after a rough night out in Ho Chi Minh City. 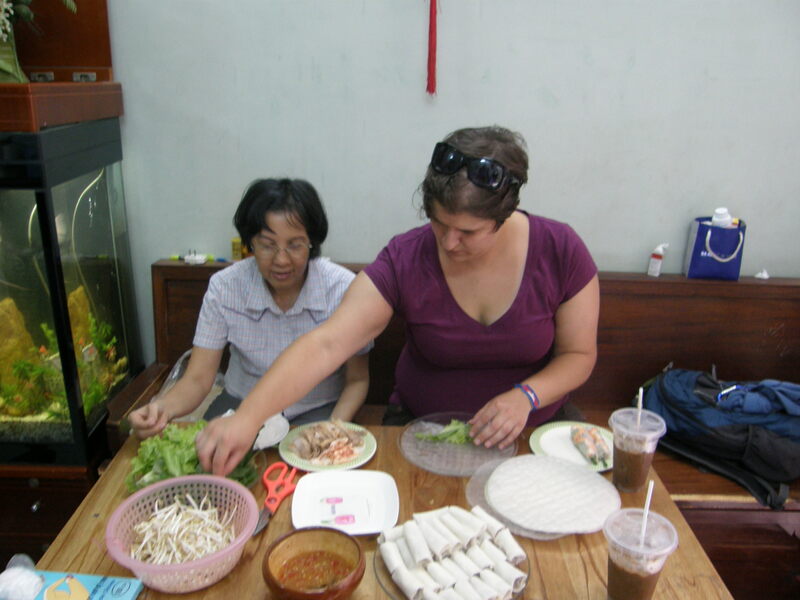 Rough doesn’t even begin to describe how I was feeling when the owner of the guesthouse knocked on my door at 6 a.m. We had agreed to go to the local market at dawn to get supplies for a Vietnamese cooking lesson. This seemed like a brilliant idea at the time, but somewhere along the way, I got lost in one too many pints of Bià Saigon and a bowl of street phở a few hours prior. There was a vague memory of a Vietnamese water park, and the sunburn to prove it. I scurried after Mrs. Long through Ho Chi Minh’s back alleys. We weren’t headed to the more well-known Ben Thanh market. We emerged from a labyrinth of alleys, and the stench of fresh blood overwhelmed me. Dead pigs and slabs of beef hung from the stalls. Chickens ran between my legs. Fisherman grabbed the catch of the day from buckets at their feet, and slammed the fish against a block of wood. Bundles of frogs, bound at the feet, stared at me as I went by, filling their guts with air. I tried to lose my senses in a bundle of keffir limes and fresh cilantro, but the smell of fresh blood mixing with motorbike exhaust overwhelmed me, and clutching myself, I threw up on the curb. Noticing that my complexion was the colour of the keffir limes, the guesthouse owner came to my rescue. 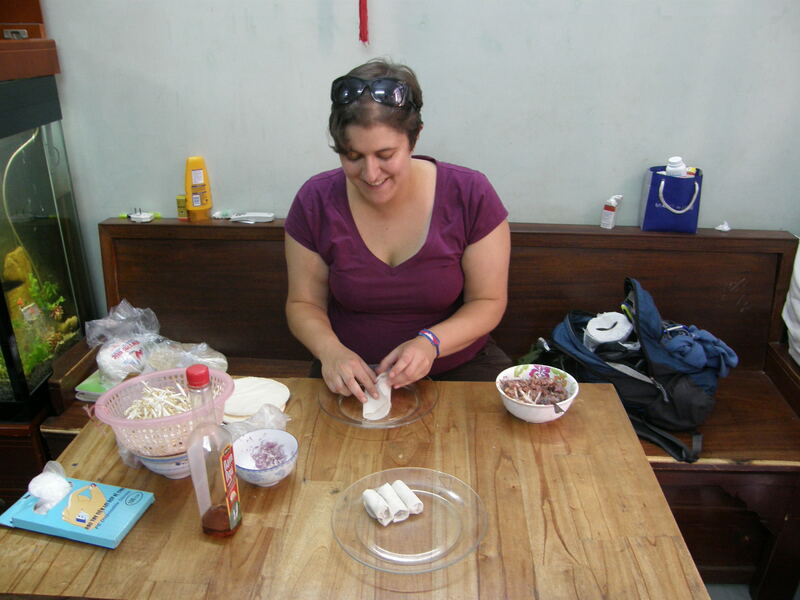 We popped into a small shop with hundreds of brands of rice noodles and rice papers. She argued with the shopkeeper over prices until they finally came to an agreement, and we were soon darting down the alleyways on our way back to the guesthouse. It was worth it. 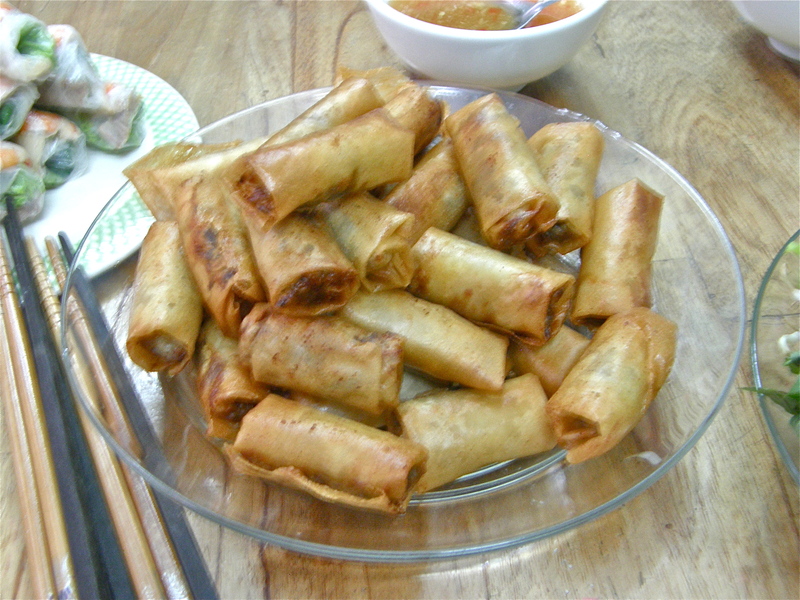 We prepared a small feast of fresh and fried spring rolls, and a fish and shrimp stew with a rich, fiery broth. Now for the deep frying! This weekend I am celebrating, and this post is inspired by that. At the start of the year, a few of us at work embarked in a weight loss challenge. This week I hit the arbitrary goal of 18 pounds that I sent for myself. I didn’t set 20 pounds, because it sounded like a scary goal. I set 18 pounds instead, because it sounded more feasible, in that same way that $19.99 sounds so much cheaper than $20. There’s no way to hide from it right now. I’m obsessed with food and nutrition. I spend countless minutes comparing nutritional value of products I know against items I am thinking about buying in an attempt to figure out if it works for me. 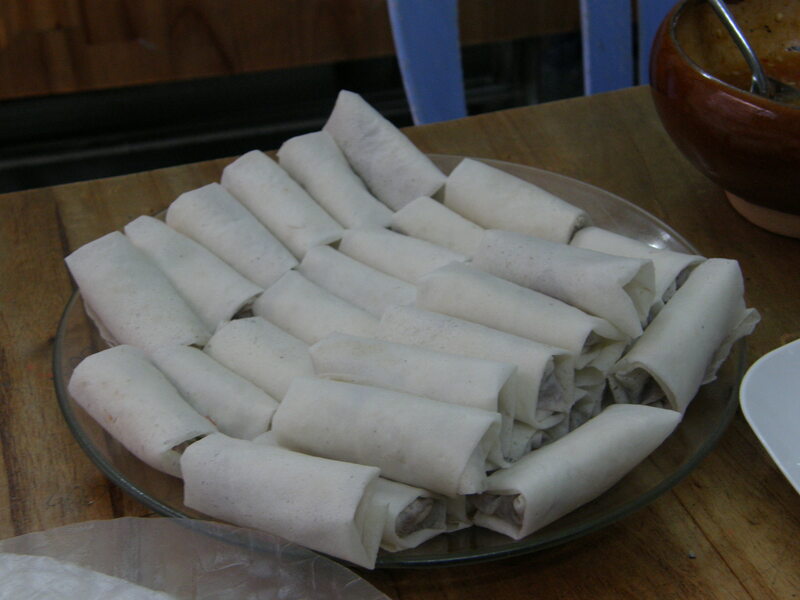 And all I can think about is getting my hands on another bag of those nasty marshmallow Skum Bananers or making a massive batch of fried spring rolls. This entry was posted in Food by hoboshutterbug. Bookmark the permalink.